Walter Green (17), Edward Bostock (17), Arthur White (16), all of Avenue-road Extension, and shoe hands, and Frank Wilson (15), Knighton Fields-road East, were summoned for playing football in the Wigston-road on the 2nd inst. PC Broome proved the case, and the boys were cautioned and discharged. Edward Bostock came from a family of at least 8, and both Walter Green and Arthur White lived with eight other people in their 2 bedroomed houses. There just was not space for everyone to sit around in the evenings reading improving books, especially when the children were strapping teenagers taking up huge amounts of leg room. Albert Austin (16), Salisbury Cottages Lorne Road, and Edgar Stapleton (15), youths, were summoned for playing football in Avenue-road Extension on the 22nd inst. Fined 2s. 6d or three days. Given that many other Clarendon Park lads were summoned for the much more unpleasant crimes of throwing stones at cats, swearing, drinking and brawling – you’d think that the local constables would have better things to do. Especially at Victoria Park, where I have been reading of some VERY fruity goings-on. But more about that some other time…regards, Elizabeth. I shall feel greatly obliged if you will send me twelve boxes of Malt rusks, for infants. Gregory, your agent here, is out of them, and says he will not have any more for a fortnight. I am entirely without, which is rather a serious matter, as nothing else suits my baby as well. Yours truly, RHODA MILNE. So who was Rhoda Milne and why was she so desperate for these rusks? Well, she was born Rhoda Stuart in Brighton c1858 and married John Milne, a Lancashire yarn agent, in London in 1885. By 1891 they lived at Gotham House with children Helen (b1886) and John (b1889) – both born in Clarendon Park Road – and two servants. 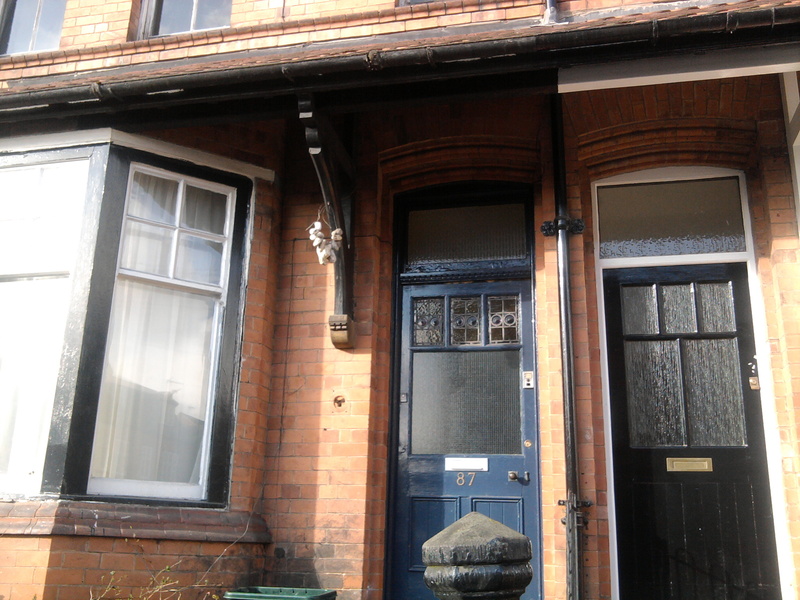 The family stayed there, going on to have another daughter Elizabeth, until some time between 1901 and 1907, when they moved to Ashleigh Road (near Narborough Road). John died in 1907 aged just 49, leaving the sizeable sum of £10, 206. 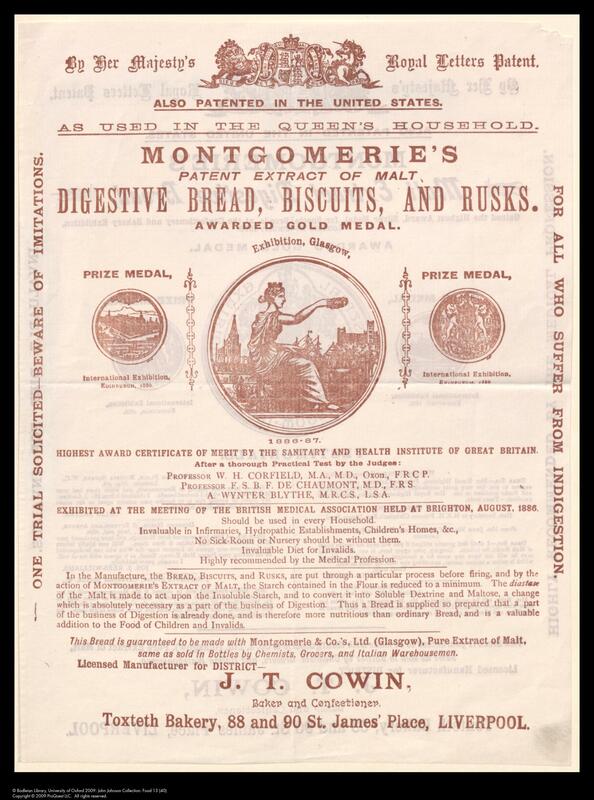 His son John – who by the way was probably the baby in the pamphlet who was greedy for malted rusks – continued the yarn agent and merchant business started by his father. I imagine his mother had received a fee from Montgomerie’s for allowing her letter to be published as advertising. I looked for a likely Gregory agent for the rusks but couldn’t find anything convincing. As to Gotham House on Clarendon Park Road – you would hardly know it was ever called that now. There is only the gate post, which has been carved with the name, to show. It’s divided up into flats now and a bit run down; a bit of a come-down from being the home of a successful businessman with a family and two or three servants. 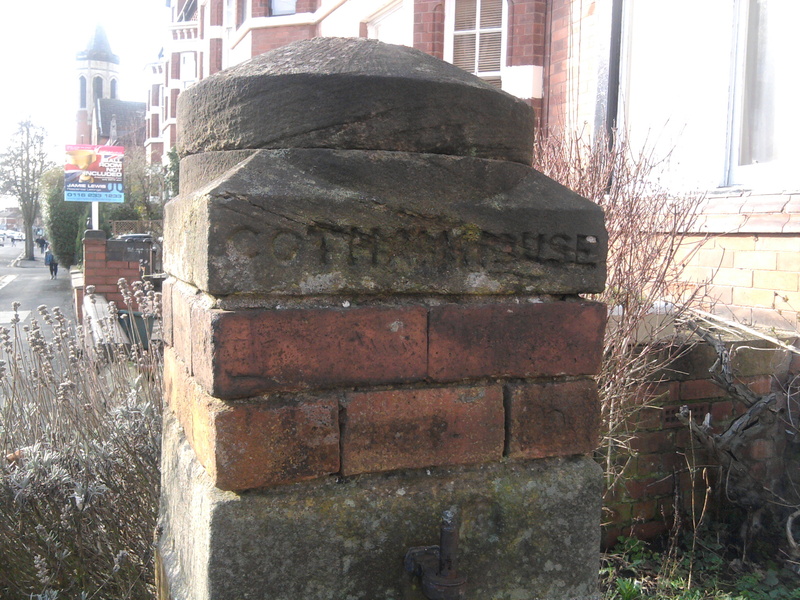 I see this gatepost four times a day so I am pleased that I came across the Montgomerie’s biscuits advertising leaflet that made me find out a tiny bit about some of the former occupants of the house. If only I could find some of those rusks in the shops today! Regards, Elizabeth. Just recently I have become aware of a few famous (or famous-ish) folk connected with Clarendon Park in some way. I thought it might make an interesting series, so here is the first. Joe Orton (1933-1967), born John Kingsley Orton, spent the first two years of his life living with parents William and Elsie at 261 Avenue Road Extension before moving to Saffron Lane estate. After leaving school, Joe started work as a junior clerk. Sometime around 1949 he began to be interested in the theatre and joined a number of dramatic societies, including the prestigious Leicester Dramatic Society. He successfully applied for a scholarship at the Royal Academy of Dramatic Art (RADA) in November 1950. There Joe met Kenneth Halliwell. They quickly became lovers. After graduating, both Orton and Halliwell went into regional repertory work and wrote novels, which remained unpublished. From 1963 he began to have success with radio plays and later at the theatre, including Entertaining Mr. Sloane (1964), Loot 1964) What the Butler Saw. Joe’s work became synonymous with the macabre. On 9 August 1967, Halliwell bludgeoned 34-year-old Orton to death at his home in London, with nine hammer blows to the head, and then committed suicide with an overdose of tablets. Orton had wanted to end their relationship. I have paraphrased this article from Wikipedia, where you can read the full article. Unfortunately I can’t include a photograph of 261 Avenue Road Extension, because when I visited on Sunday it didn’t appear to have one. 259 yes, 263 also yes, but unless it is behind the two houses in the manner of Platform 9 and three-quarters, there is no 261. I will see if I can find out about renumberings. More famous Clarendon Park residents some other time – regards, Elizabeth. Bit gloomy, this subject, but it’s a big one and actually quite interesting. Not everyone who lived in Clarendon Park in the past died there, but a lot did and especially – sadly – the children. National infant (under 1 year) mortality in Victorian England was something appalling like 160 per 1000 live births in 1899 and the figure for Leicester, as a town, was probably significantly higher. One in three children would not live to see their fifth birthday. Adults also had a much lower life expectancy than today. As you can see, the vast majority of deaths were in children 2 years or younger, though the risk levelled off a bit after that. A surprising amount of people died in early adulthood, and most adults died in what we would now consider middle age, rather than after the current retirement age. There must be many more deaths in the 81+ bracket today. It is notable from the records how the number of child deaths gradually reduces and the age of people generally increases over the 19 years I looked at. So, how and where were all these Clarendon Park folk buried? There isn’t a burial ground in Clarendon Park itself. Many people were buried at Welford Road Cemetery, which opened in 1849 and provided space for people who were not members of the Church of England, as well as those who were. Clearly a lot of people chose to be buried at St Mary Magdalene, Knighton, as St John the Baptist, Clarendon Park and St Michael and All Angels, Knighton had no graveyard (many if not most new Victorian churches were built without). Even nonconformists were buried there – under the Burials Act of 1880 any christian burial could be carried out at parish churches, and quite a few Methodists and other nonconformists were buried at St Mary’s. Some people were buried in other parishes, for example if they had lived many years in a village or another part of Leicester before moving to Clarendon Park. Victorian funerals were big business, with mourning warehouses advertised in the local press. The middle classes were obviously able to spend more on the trappings of mourning but it was a matter of pride for many poorer people to give a decent funeral. Many would not have been able to provide even that. Cab Proprietor William Maurice Jackson was also a funeral undertaker, and coffins would have been provided by some of Clarendon Park’s many carpenters, joiners and builders. Thank goodness those days have passed, and most Clarendon Park dwellers are in good health and can expect to live to a reasonable age. I promise to bring you something less morbid next time! Regards, Elizabeth.